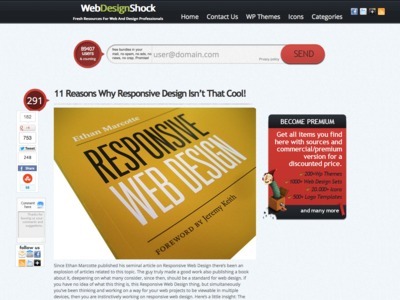 Tim Strehle’s Blog » 11 Reasons Why Responsive Design Isn’t That Cool! “Viewing a responsive website on a mobile device forces the CPU and memory of it while resizing images because you are downloading a large image, uncompressing it in your phone’s memory and then resizing it to fit a small screen. […] CSS media queries work incredibly well hiding things, but not that well removing them. CSS media queries won’t remove any unnecessary script or html you won’t use on mobile or desktop versions. It just leaves it there: hidden.